Food poisoning (or foodborne illness) happens when you get sick from eating or drinking something that has harmful germs in it – like bacteria, viruses, or parasites. Two common causes of food poisoning are E. coli and Salmonella. •	Buy food from stores that look and smell clean. •	Don’t buy food past “sell by,” “use by,” or other expiration dates. •	Wash your hands often with warm water and soap – especially before and after touching food. •	Make sure food is cooked to a safe temperature. •	Keep raw meat, poultry, and seafood away from cooked and ready-to-eat food. •	Keep cold foods cold and hot foods hot. This helps prevent bacteria from growing. You can get food poisoning from eating bad (contaminated) food. Bacteria are the most common cause of food poisoning. Bacteria can get into food in several ways. • Vegetables, and fruit may pick up bacteria where they are grown or packaged. •	Foods can also pick up bacteria at the store or in the kitchen. This can happen when you don't wash your hands, utensils (like knives), cutting boards, or counters. •	If hot or cold food is left out at room temperature for more than 2 hours, bacteria already in the food can multiply and become more dangerous. •	Believe it or not, sprouts are notorious for causing digestive troubles. Sprouts are grown in warm and humid conditions. These conditions are ideal for bacteria to grow.They are also risky because they are often eaten raw or lightly cooked. •	Even raw juices can harbor E.coli and you must make sure that they are freshly squeezed before consuming them. •	Food poisoning due to Toxic agents (Pesticides remains on fruits and vegetables or mushrooms which are poisonous). •	Poor hygeinic conditions, poor sanitation and non cleanliness of the premises where the food is prepared leads to contamination of food. •	Food not packed properly and not stored at right temperature conditions also leads to contamination. •	Food poisoning from potatoes is very rare, but not impossible since raw potatoes can sometimes be of a 'wild' variety that contains toxins to ward off predators. •	Cheese can easily be contaminated with bacterias such as Salmonellaor Listeria, which can, in very extreme and rare cases also lead to miscarriages. •	Raw meat, poultry & fish may pick up bacteria where they are grown or packaged. 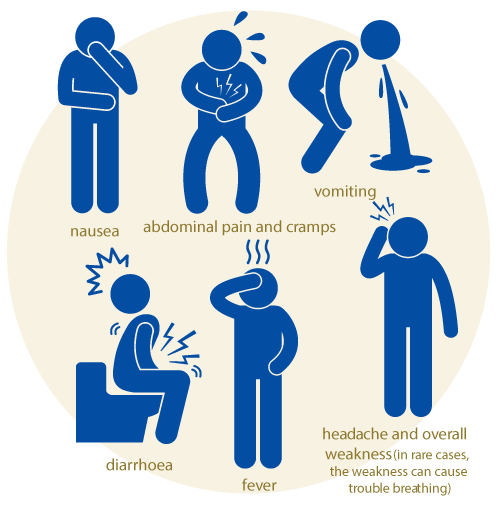 Signs of food poisoning can start hours or even days after eating bad food. Usually the effects only last for 1 or 2 days, but they may last up to 2 weeks.